Lieutenant Klag has been a loyal servant of the Klingon Empire for years. He's a survivor. Serving in the Klingon Defense Force, he has encountered his fair share of troubles, and he should have died countless times, yet somehow he has always come away with his life. Klag is currently serving as Second Officer under Captain Kargan aboard the I.K.S. Pagh, a position that will undoubtedly hold even more perils in store for him. But Klag has no intentions to enter Sto-Vo-Kor just yet. During all those years of fighting and exploring, he has learned how to survive. And now he is passing his wisdom on to his fellow Klingons. Klag (Second Officer) is to Klingons what Neral (Seasoned Politician) is to Romulans: a neat way to dodge a number of very popular dilemmas that often stop a mission attempt cold. 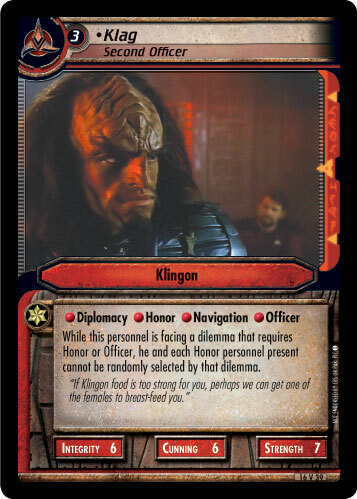 An Issue of Trust and Personal Duty can be found in almost every dilemma pile, and usually they are a sure stop for an Integrity-based Klingon deck. Also, event-heavy decks like to stock multiples of the "8-costers" - with the exception of Tsiolkovsky Infection, all of them require either Honor or Officer. Even if you fail to meet the requirements, thanks to Klag, our honorable warriors can now avoid all those random selections - of course, this means that most of the time the non-Honor personnel you brought along will automatically be selected to be stopped, killed, or captured, but that's the price of not following the teachings of Klag the Survivor. Still, with the number of Klingon affiliation personnel who have that skill, it's entirely possible to build a solid deck in which all the guys you want to take along for mission attempts have Honor (or can exclude themselves). Just watch out for The Clown: Bitter Medicine! By the way, did you notice how our survival expert has both the Diplomacy skill and a cost of three? While serving aboard the Pagh, Klag once had the chance to watch a human exchange officer serve aboard the ship, so maybe it would be a good idea to let Klag participate in that Interstellar Treaty program as well? I'm sure there is at least one culture that could benefit from the wisdom and experience of such a seasoned warrior.